Microscopic soft robots could have a variety of health applications. Here’s an uncomfortable thought, lots of your body’s tissues are moving around inside you right now. Tiny muscle movements are imperative to the proper regular function of the human body. The proper opening and closing of our various vasculature helps keep the right juices flowing in the right directions. Improper movements can lead to the development of various illnesses. 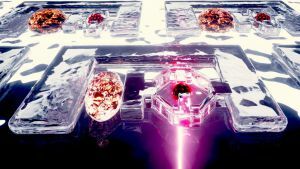 For that reason, a team of researchers at the Ecole Polytechnique Fédérale De Lausanne (EPFL) have built a set of microscopic tools and soft robot devices which could be implanted in the body to help regulate various organ movements. Their research, published in the journal Lab on a Chip, could one day lead to implants which help stimulate muscle movements or deliver medicine from within our bodies. Inspired by the body’s locomotor system, the EPFL team assembled the tiny bots from microscopic hydrogel components, like high-tech building blocks. The blocks form a sort of “skeleton” while the addition of tendon-like polymers allow the structure to flex and bend. With a flash of near-infrared light, scientists can trigger a rapid contraction and relaxation cycle which lasts just a few milliseconds. The result is a system of cell-sized artificial bones and muscles which can carry out complicated microscopic manipulation tasks within the body. Not only is their research useful, it has practical applications as well. Such microscopic devices could be used in research functions which require repeated stimulation of microscopic biological samples. They could also server a variety of functions as medicinal implants such as the on-demand delivery of medicine or the remote manual stimulation of various organ systems. One day we may all make use of such tiny implanted robots to help keep our systems running smoothly.